Space at free PATCO parking lots is always at a premium. Snow makes it worse, especially when lots don't get plowed due to cars parked there for days and days. In many of the towns it serves in South Jersey, PATCO has a parking problem. The problem is worse when there is snow: Mounds and mounds of snow choking its lots in the smaller towns, like Collingswood, Westmont in Haddon Township and Haddonfield, where demand at morning rush hour can exceed supply – even on a good day. Add snow to the parking equation and you get something like the TV show “Survivor” mixed with the child’s game musical chairs. Kevin commutes to Philadelphia via PATCO most days and will be following this story with occasional other reports on commuting issues for those traveling form South Jersey to Philly. If you have ideas, comments, suggestions or praise for PATCO, contact him at kevin@phillyvoice.com. Piles of pushed up snow fill corners, eating up space. Cars left in the PATCO lot since the storm started Friday night make it impossible to plow. And street parking, primarily on Haddon Avenue, the spine connecting those three towns east of Camden, is limited, highly regulated and metered. Angela Burckley, a resident of Haddon Township, took one quick look at the PATCO lot in Westmont on Tuesday morning. Seeing no spots, she kept driving to Collingswood, even though she lives closer to Haddonfield, where she never seems to have luck finding a decent spot. She lucked out in Collingswood, nabbing a spot that had opened up just seconds before in a lot near the station already at capacity. Ron England, a Westmont Realtor, said PATCO is “killing” parking in his town by placing a portable field office in a commuter lot and then fencing it off, eating up nearly 20 spaces for the past three months or so. He also pointed out that the heavy snowfall coincided with a resumption of college classes, meaning increased demand for commuter parking. The absence of students during winter break and over the summer assures there is enough PATCO space the rest of the year, England said. “Whenever there is a lot of snow, there are less parking spaces,” said Teri Tighe, who commutes from Collingswood to Philly every day. “A couple of us fussed today at Collingswood because they haven't plowed the street-facing parking spaces in Lot 1,” a smaller PATCO lot some distance from the station. And most of the metered lots near PATCO controlled by Collingswood were either unplowed or only partially cleared by Tuesday morning. Maggi Downham, an educator and Haddon Township Planning Board member, said commuters park “all up and down” the township streets when parking is an issue, especially with snow. Dana Tischler, who car commutes from Cinnaminson to Collingswood to catch the train, said she is “sometimes late for work” because there is simply not enough parking in the PATCO lots in Collingswood. She pointed to several blocks of row homes with cramped streets tucked up against the elevated train station and said she sees residents there parking in the commuter lots simply because there is so little parking on their residential streets, where parking is by permit only. While parking in the PATCO lots is technically limited to customers and for a limited stay, there seems to be little or no enforcement, based on snow-covered cars in the lot. Tischler knows the Ferry Avenue station, not far away in Camden, has more parking space than Collingswood, but she doesn’t feel comfortable parking her car there. Cass Duffey, Collingswood’s director of community development, admits there are issues with parking – and those issues worsen with snow. 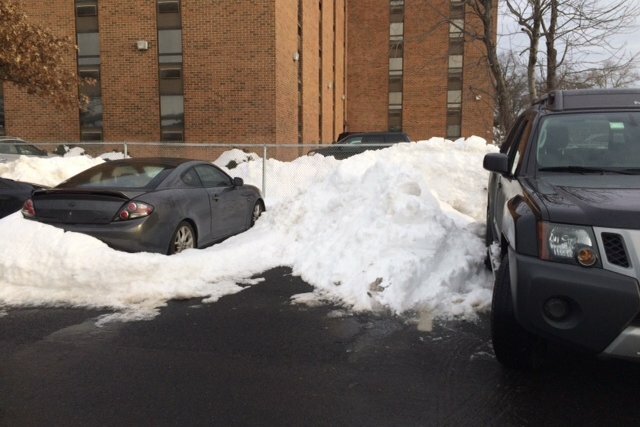 “Not everything gets cleared perfectly when you get 15 inches of snow in 24 hours,” she said. And she added that “PATCO is higher than us on the food chain” when it comes to clearing snow for commuters. Duffey also said calling the town’s Public Works Department (856-858-0533) is the best solution. She referred PhillyVoice to the borough police to discuss parking enforcement; a call was not returned. “We understand that our riders are accustomed to having access to more spaces at our parking lots,” PATCO spokesman Kyle D. Anderson said. “While every effort has been made to maximize the number of available spaces, the unfortunate reality is that, because of the record snowfall, it could be some time before all of the lots are completely clear. “While we’ve actually trucked out some of the snow to Ferry Avenue to open up additional spaces at Collingswood and Westmont stations, the sheer volume of snowfall limits our options,” Anderson said.